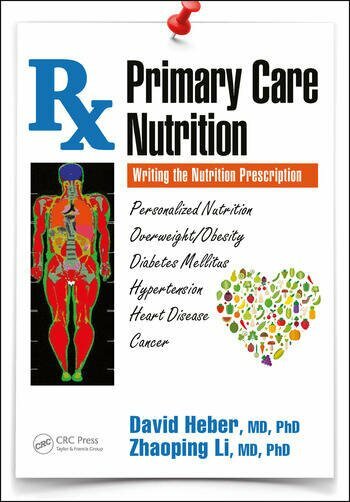 This book contains the necessary knowledge and tools to incorporate nutrition into primary care practice. As a practical matter, this effort is led by a dedicated primary care physician with the help of motivated registered dietitians, nurses, psychologists, physical therapists, and office staff whether within a known practice or by referral to the community. It is essential that the nutrition prescription provided by the physician be as efficient as possible. While many team members have superior knowledge in the areas of nutrition, exercise, and psychology, the health practitioner remains the focus of patient confidence in a therapy plan. Therefore, the endorsement of the plan rather than the implementation of the plan is the most important task of the physician. This book proposes a significant change in attitude of primary health care providers in terms of the power of nutrition in prevention and treatment of common disease. It features detailed and referenced information on the role of nutrition in the most common conditions encountered in primary care practice. In the past, treatment focused primarily on drugs and surgery for the treatment of disease with nutrition as an afterthought. Advanced technologies and drugs are effective for the treatment of acute disease, but many of the most common diseases such as heart disease, diabetes, and cancer are not preventable with drugs and surgery. While there is mention of prevention of heart disease, this largely relates to the use of statins with some modest discussion of a healthy diet. Similarly, prevention of type 2 diabetes is the early introduction of metformin or intensive insulin therapy. David Heber, MD, PhD, FACP, FASN, is a professor emeritus of medicine and public health at the David Geffen School of Medicine at University of California, Los Angeles (UCLA) and is internationally prominent in the fields of nutrition, metabolism, and obesity and its associated complications. He is also a founding director of the UCLA Center for Human Nutrition and a founding chief of the Division of Clinical Nutrition in the UCLA Department of Medicine where he directed multiple National Institutes of Health–funded research programs, including the UCLA Clinical Nutrition Research Unit, the UCLA Dietary Supplements Research Center: Botanicals and the UCLA Nutrition and Obesity Training Grant. Dr. Heber is the founding chair of the Herbalife Nutrition Institute, and is a member of the McCormick Science Institute. Dr. Heber is board certified in internal medicine, and endocrinology and metabolism by the American Board of Internal Medicine and is a certified physician nutrition specialist. He earned his MD at Harvard Medical School and his PhD in physiology at the UCLA. Dr. Heber served as chair of the Medical Nutrition Council of the American Society for Nutrition and, in 2014, was elected as a fellow of the American Society for Nutrition, the highest honor of the society. He has been listed multiple times since 2000 as one of the Best Doctors in America including 2015–2016 based on a survey of over 35,000 physicians in the United States. In 2014, according to Reuters News Agency, he was in the top 1% of cited authors in the field of agricultural sciences and was listed as one of the most influential scientific minds of 2014. Zhaoping Li, MD, PhD, is the director of the Center for Human Nutrition, chief of the Division of Clinical Nutrition, and a Lynda and Stewart Resnick Endowed Chair in Human Nutrition at David Geffen School of Medicine at the University of California, Los Angeles (UCLA). Currently, she is the vice president of National Board of Physician Nutrition Specialists, the president of the World Association of Chinese Doctors in Clinical Nutrition, and a member of American Society for Nutrition Medical Nutrition Council. Dr. Li is board certified in internal medicine and a physician nutrition specialist. She completed her MD and PhD in physiology at Beijing University, China and has been a faculty member at UCLA. She is leading the Center for Human Nutrition to have vigorous research programs in nutrition, microbiome, and metabolism; providing mentorship and didactic and informal training for young scientists, premed, medical students, medical residents, fellows, and clinicians; and directing clinical programs that specialize in metabolic diseases, bariatric medicine, gastrointestinal diseases, and cancer prevention/treatment. For nearly three decades, Dr Li’s research interest has focused on translational research in the role of macronutrients and phytochemicals in the prevention and treatment of obesity-related chronic diseases. She has been a principal investigator for over 50 investigator-initiated National Institutes of Health– and industry-sponsored clinical trials and published over 150 peer-reviewed papers in journals such as JAMA, Annals of Internal Medicine, American Journal of Clinical Nutrition, and Journal of American Dietetic Association.